From this band’s name alone, the crude French speakers among us may be able to divine some hazy idea of the moody hues contained within the self-titled debut EP from Burlington ambient instrumental duo Tapis Bleu. But that would be judging a, well, rug by its color. And the floor is no place for this poignant, well-crafted harmonic tapestry, one of the most unusually innovative local creations to reach our ears this year. Two area music stalwarts comprise the duo. Saxophonist Caroline O’Connor — perhaps best known for contributions to Burlington’s psych-rock darlings The Cush — is the record’s driving force. O’Connor’s veteran command of the instrument is at full, impressive display. Fusion-enthused percussive contributions come courtesy of the well-traveled Sean Altrui, who might be familiar from his work with local group Bad Ju Ju and, more recently, with experimentalist Mark Knuffke, among others. Altrui sets the EP’s background drones and steadfast djembe rhythms. Each of the EP’s three tracks tenderly materializes from the foundation of a sparse, synthesized background chord. On “Mystery,” O’Connor’s gritty, woeful saxophone is in near constant motion around Altrui’s entrancing, clopping percussion. The combination works wonderfully — a peaceful, sonic surrender of classicism to modernism. “Day Before the Art Hop” further melds Moog loops with O’Connor’s sax. But the tone here is not as festive or cheerful as that for which the renowned B-Town arts festival has come to be known. Tapis Bleu’s somber melodic sequences linger; a soundtrack better fit for an empty gallery, or a painting left out in the rain. Experimental instrumentalists — particularly those with highly trained skills on woodwinds and African drums — are rare birds in rock-conscious burgs like Burlington. Among the swarm of guitars, how nice it is to hear a saxophone. 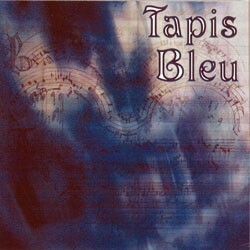 To belabor an earlier point — and crib The Big Lebowski — Tapis Bleu is a superb sonic tapestry that really ties the room together.